I am dipping in a bit to this year’s Walk My World project. As always, Greg and Ian and company are encouraging people to think of identity of Self, and the connections to the Larger World. One of the early prompts has to do with thinking of Culture, and how we reflect the Culture we have inhabited. I’ve been thinking a lot over time about my own privileged role as a White Man from the Middle Class teaching mostly White Boys and Girls from an insular White Suburban Community. (All those capital letters make what I wrote look strange and sort of gibberish.) Listening to Macklemore, and thinking of the controversy the year he and Ryan Lewis won the Grammy as white rappers, is giving some focus. But I don’t have answers. Only questions. Recently, I was in the audience of an event for Martin Luther King Day, at a local church in our small progressive city (Smith College sits at the center), and the guest speakers included college representatives of the Black Lives Matter movement. I glanced around the audience and saw mostly White Faces. The moderator of the panel was a white college representative, who dominated the discussion in an attempt to put the movement into some cultural context. I just wanted to hear the young organizers talk. The raising of a Black Lives Matter banner sign on City Hall after that same MLK event continues to cause support and dissent and ripples and indignation in our community, as much for defending and criticizing the movement as for using City Hall as a backdrop for political statements. We’ve had our share of newspaper articles about the flying of the Confederate Flag in local communities, too. Not even our liberal Western Massachusetts is immune to the ways of the world. I know I grew up privileged, even though we were by no means wealthy and even though I suspect my parents struggled at times (and kept it hidden from us kids) to keep us in the town they chose to raise a family (coming from New York City to do so). In fact, when I signed up as an infantry soldier in the National Guard, it was the first time I spent any extended time with people of other races, mostly Black soldiers, and most of them were from a deep urban setting that I had little understanding of. Until then, I was blind to the ways of the world. Now I was the lone white man in a platoon of black men. Mostly, I kept quiet and tried to learn from them about the world I did not know. It was a culture shock, but one I am very grateful for. It taught me lessons about life. And it is in life that we make change, right? As part of the Western Massachusetts Writing Project, we make it part of our Mission Statement to focus on Social Justice themes and to find ways to work with school districts in urban and rural centers that often are left out of things due to socio-economic issues. Race and access and equity issues remain on the forefront of many of our decisions of programming. I won’t deny that where I come from — the World Where I Have Walked — has opened up doors because of the color of my skin (white), my gender (male), and the place where I grew up (suburban Connecticut), and other factors that I was born into. But I can try to make a difference for the young people whose lives I can impact in my own classroom as teacher or in other classrooms as profession development leader. I can lay the foundation for tolerance in the hearts of my boys. We can all make a difference. We just need to try. 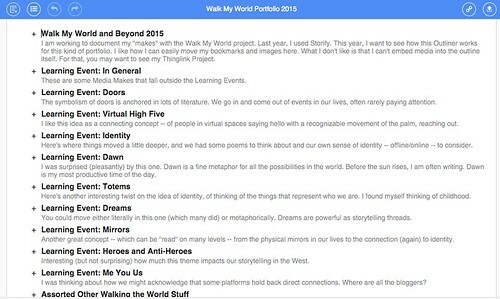 I know there are a few more learning events for Walk My World (including the last one around heroic myths and the current one around the Story of Us) but I had pulled together a sort of digital portfolio via ThingLink as a way to capture the projects I had been doing since the start. I like using the visual, with links, although it does not leave room for post-project reflections without cluttering up the page. Oh well. 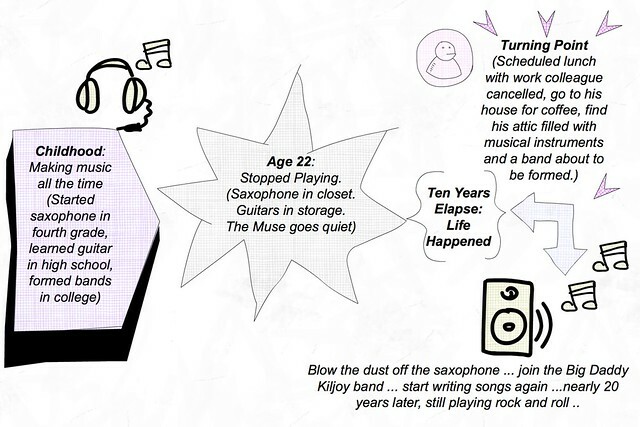 I am also keeping a Diigo Outline that I can share out another time. That might give me more reflective room to write. For now, I hope you enjoy a walk through my work and tinkering. 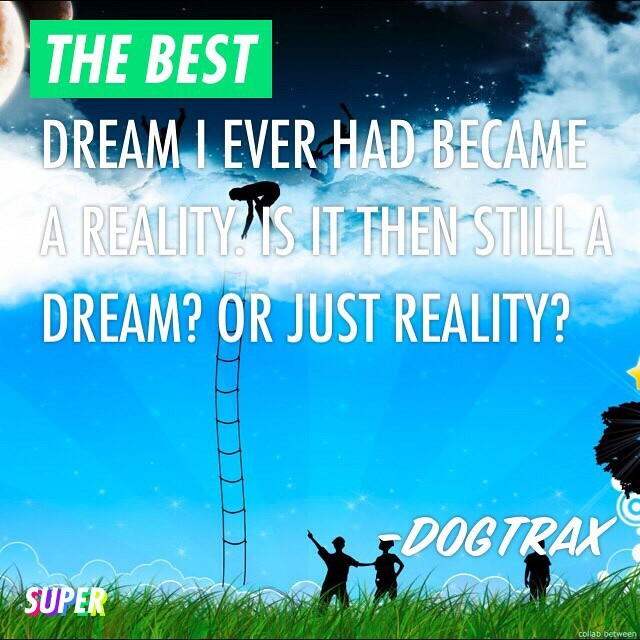 Wondering what Walk My World is? The theme of the current Walk My World is the Heroic Journey, and it reminded me of this project that I did years ago with my sixth graders after reading The Lightning Thief and our immersion into mythological stories. 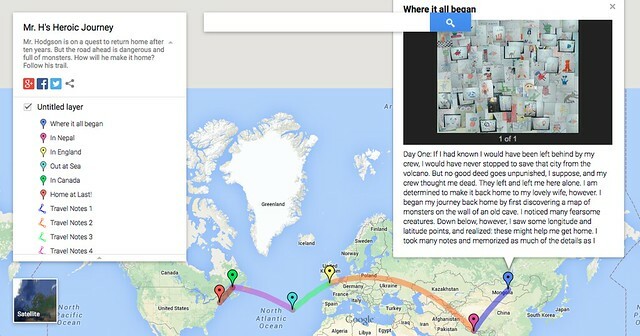 We used Google Maps to map out the stories and then viewed them in Google Earth, too. I am working on a mapping project as a way to document what I have been doing for Walk My World. I know there are a few more learning events to go (we just slipped into the Hero one), but I feel I need to do this digital documentation now. 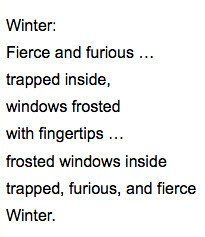 This poem/podcast is an overarching theme for my portfolio. 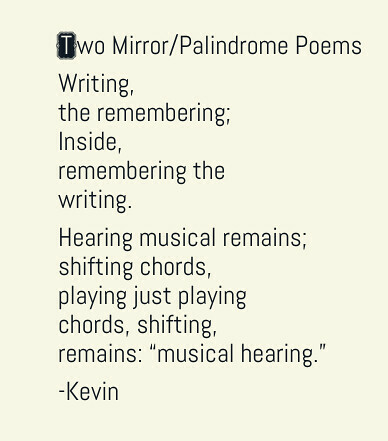 The Learning Event for Walk My World this week has been “mirrors” and it had me remembering the concept of the mirror/palindrome poems, where the poem reads the same backwards and forwards. I’ve been trying my hand at them a bit. First, I tried poems about writing and music. A key element for these poems is the use of punctuation to create pauses one way that don’t exist the other way, and the center line as a bridge between the sections. Then, yesterday, I had this idea of taking the mirror image even further. 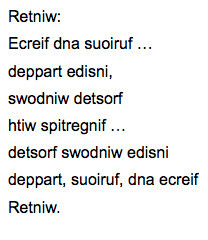 I used an online site that will remix text, allowing you to create text written forward and render it backwards. I also wondered how it would sound, so I used another site that allows you to record your voice and then turns the audio in reverse.